Orlando’s historic Orange County Courthouse, built in 1927, now houses the Historical Society of Central Florida, which exhibits information about local and regional history dating back 12,000 years. 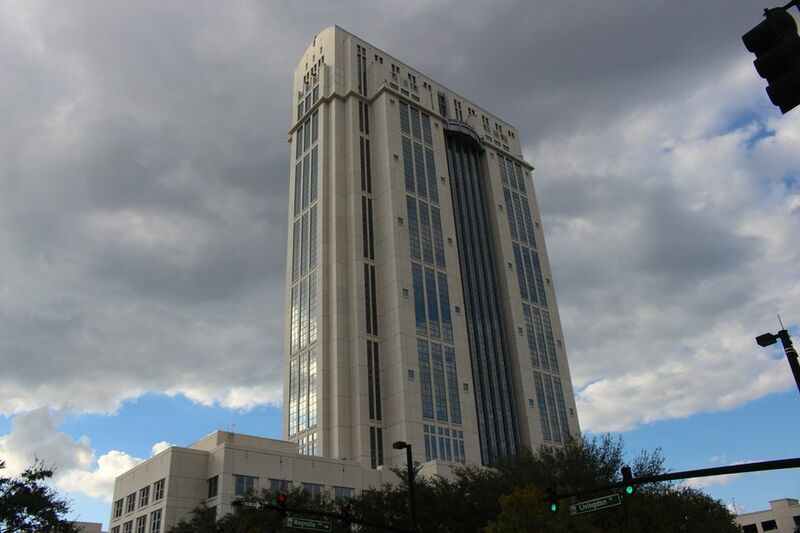 Due to the exploding growth experienced in the Orlando area, the original courthouse could not adequately serve the needs of the residents, so in 1997, a post-modern, high-rise building complex was completed in downtown Orlando that is the current Orange County Courthouse, serving the Ninth Judicial Circuit Court of Florida. The complex consists of a 23-floor tower flanked by two five-story office buildings—Building A, occupied by the public defender and Building B, occupied by the state attorney. Busy courtrooms, the court clerk's office, and a jury assembly area are located in the tower's four-story base. The jury assembly room includes a cyber cafe with Internet access, a private room for nursing mothers, cell phone charging stations, and storage lockers. The central downtown Orlando location of the main Orange County courthouse allows citizens to accomplish many tasks in one central place. For example, you can get copies of important records; appear in traffic court; pay a traffic ticket; apply for passports and marriage licenses; file lawsuits; and even get married. You can request an organized tour of the Orange County Courthouse by completing the online tour request form. Anyone over the age of 18 can file a small claims case in Orange County Civil Court to settle legal disputes if the dollar amount involved is $5,000 or less, excluding costs, interest, and attorneys' fees. The Orange County Civil Court also handles claims up to and including $15,000 for any civil, noncriminal matter. The Circuit Civil Court handles non-criminal cases in which individuals or businesses sue for damages exceeding $15,000. The clerk’s office at the courthouse has a self-help center designed to provide legal assistance to Orange County citizens who do not have a private attorney and assists them in the filing of court cases. Approximately 595,000 new court cases a year are filed in the Ninth Circuit Court of Florida. A Place for Children is located on the second floor of the Orange County Courthouse where kids up to the age of 14 can spend four-hour blocks of time. There is no fee for this service, and a morning and afternoon snack are served. This licensed, drop-in child care center provides a fun place for children whose families have business with the courts so they don't have to attend long or potentially upsetting court sessions with adults. All couples who want to get married in Florida must apply for a marriage license. You can apply online and then bring the completed application to the courthouse. Marriage licenses are issued the same day as long as all requirements are met. But there is a three-day waiting period for couples who don't provide proof that they have completed a premarital preparation course. All Orange County deputy clerks are authorized to perform marriage ceremonies. The courthouse has a private wedding room, and family and friends are invited to attend. Ceremonies are performed in Room 310, Mondays through Fridays, from 8:00 a.m. to 4:00 p.m on a first-come, first-served basis.